Click on the link. If Any of you have similar online albums, please let me know and I will shar the link. 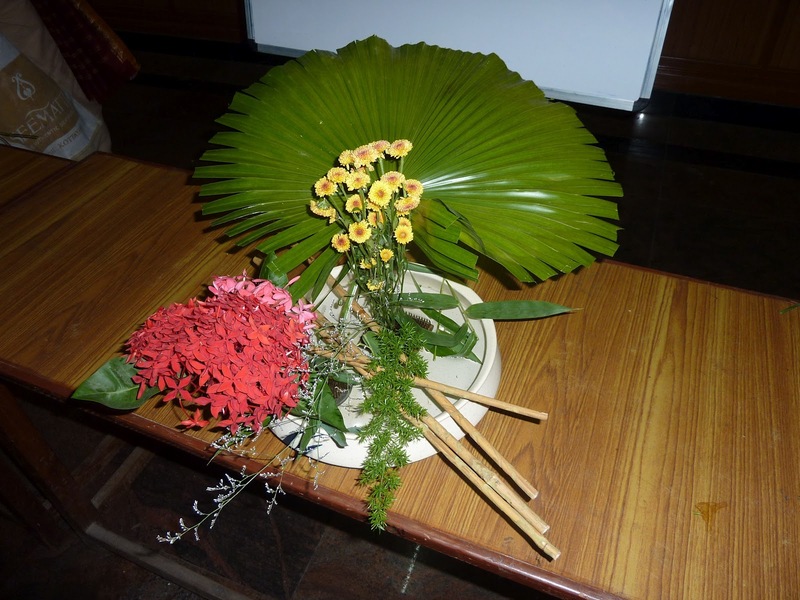 II's south-east Asian regional conference was held in Delhi in November, and our member Sensei Meenu represented the Chennai Sogetsu Study Group!! Here is her report. Day one was registration and later a demonstrations by the Mumbai II chapter. The Ohara school was colorful and different and espoused an innovative aspect of their school. 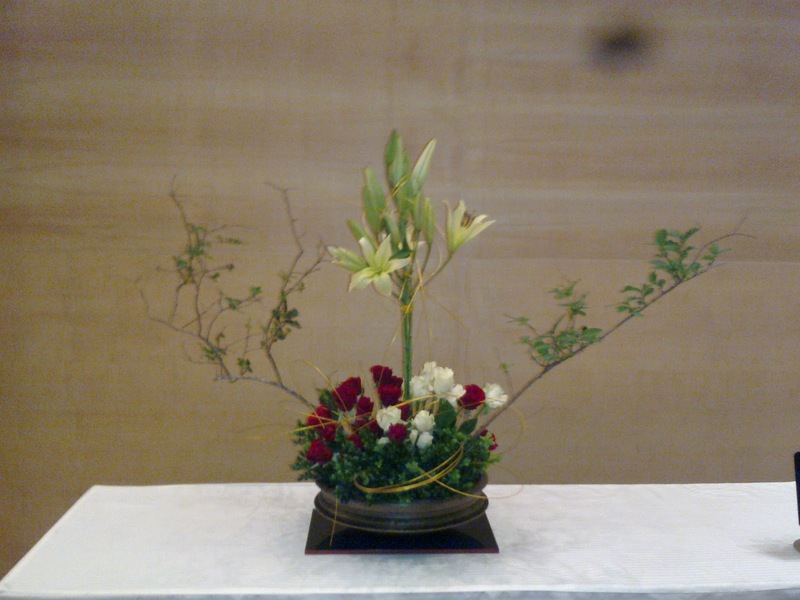 There was also a demonstration of Sogetsu style by senior sensei. Mala Agarwal of Mumbai. She had a theme running through all 6 separate pieces and it was named colors of India. That evening had a Oddissi performance by Arushi Mudgal, alumni of the Gandharav Music School. 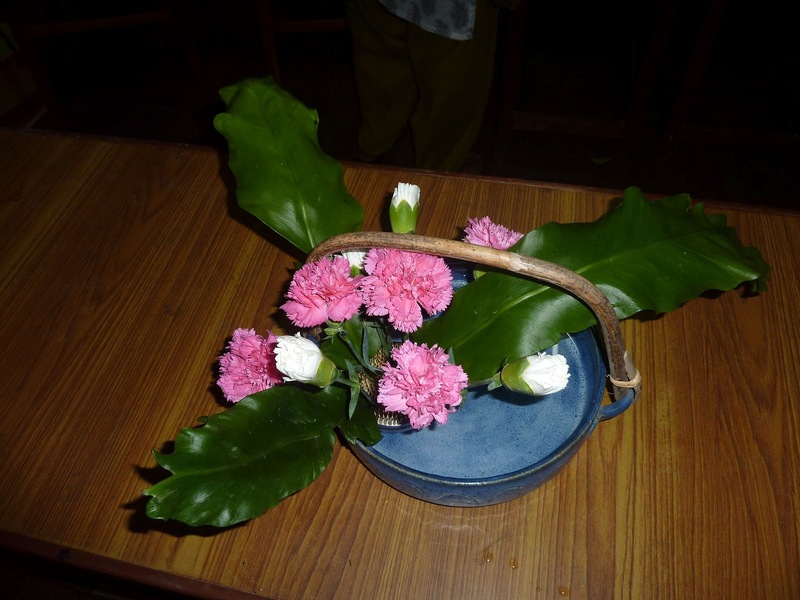 There was a short speech by Lily Zang President Ikebana international followed by a welcome dinner at the venue. 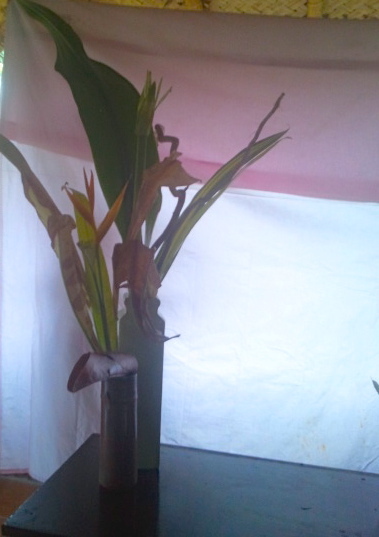 The venue had an ikebana bazaar where everything needed for the demonstration was sold. 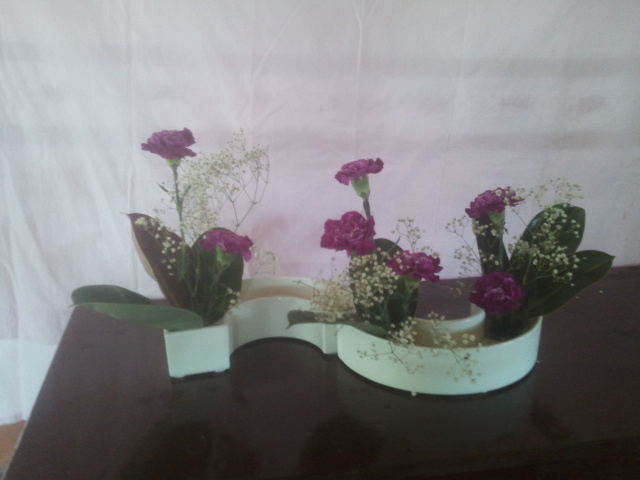 My arrangement was heliconias and baby's breath done on 3 steel banana shaped plates with real bananas to balance the plates had to be completed by noon. The venue was vacated at about 2 pm for security reasons as the Chief Minister was expected by 5 pm. 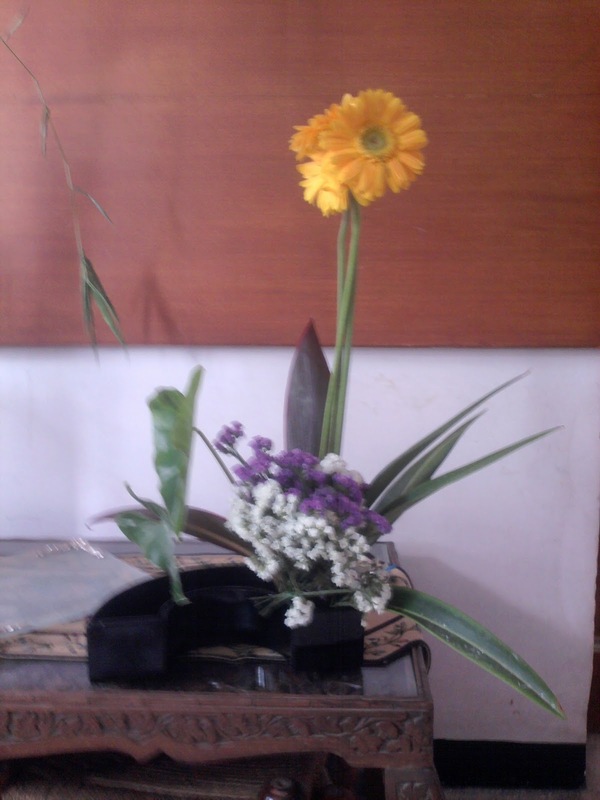 She viewed my arrangement and asked the theme and said with a smile only thing missing are the idli and dosais! 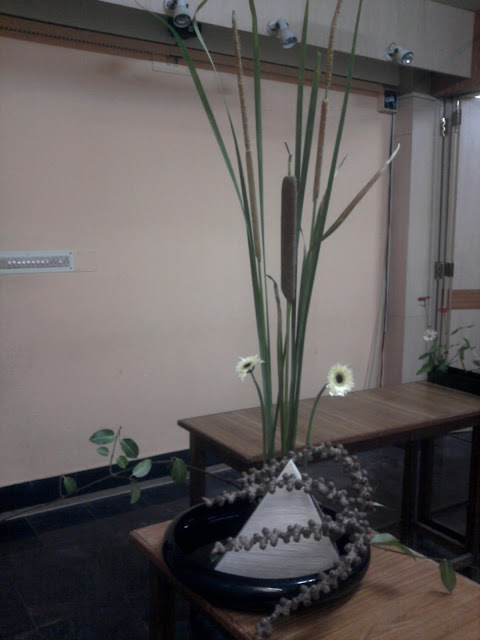 Most of the arrangements were rather large and used up a lot of material. 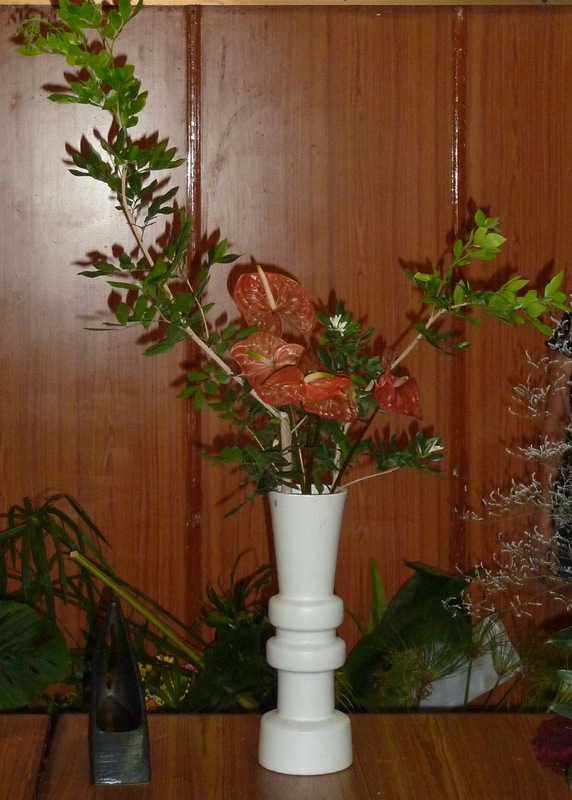 Proteas, calla lily and dried mushrooms were in prominence amongst others. Lilly Zhang's No kenzan arrangement with bamboo, cane and anthuriums was a delight for all the participants and guests. On the 3rd day, there was a complimentary city tour and the exhibition was opened to the public. There was a demonstration by Veena das Director Sogetsu school Delhi, which was the story of a girl called Tara along with a Kathak performance by a disciple of Shovana Narayanan. 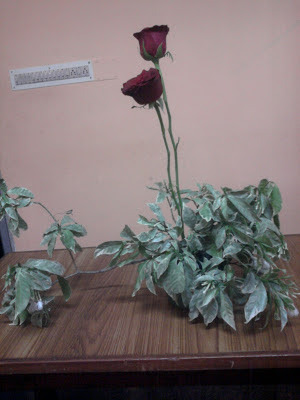 The combination of the story and dance and flowers amalgamated within a specific theme was wonderful. 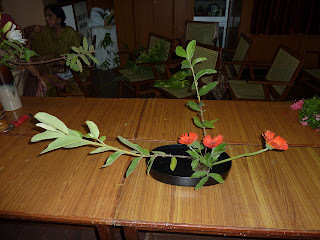 There was a home hospitality dinner after the visit to Kamani auditorium the venue of the exhibition. On the 4th day a demonstration by Iemoto Rishi Ootsuka of the Koryu katabomi kai school....at Satya Sai auditorium, Lodi Road. 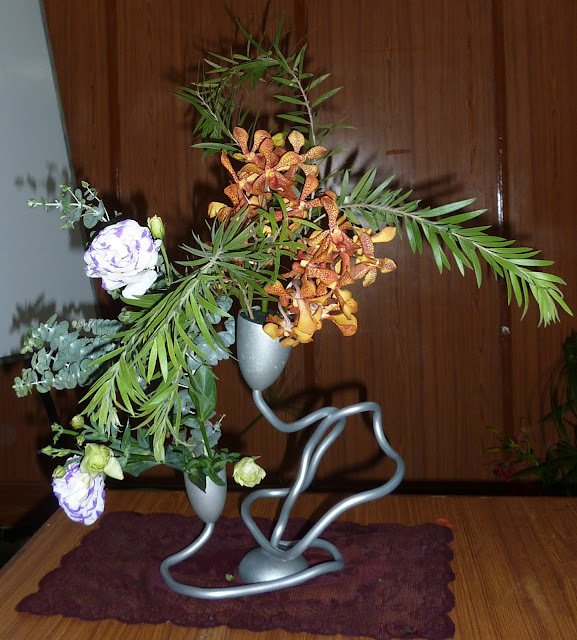 This was an exposition of a innovative different totally new concept and style of Ikebana. 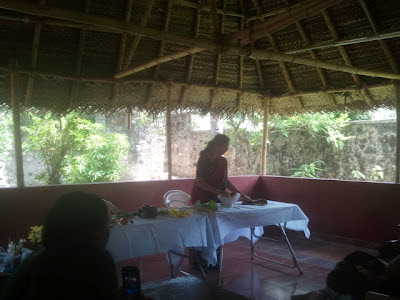 The final day had the Masters Workshop and 2 Ohara demonstrations by Ms. Indira Mishra of Gurgaon and Ms. Meenakshi Devi of Hyderabad. The closing of the conference was followed by Sayonara dinner where our Study Group's gift of incense stand was handed over to each guest. Most rewarding experience which though fleeting in terms of time would remain in my memory for a long long time. Friendships through the medium of flowers established so many contacts! And such visual delights each nuance different based on cultural traditions of the participating regions and countries. Dec 14th 2012 Our last workshop of the year was a colourful, well-attended freestyle session. 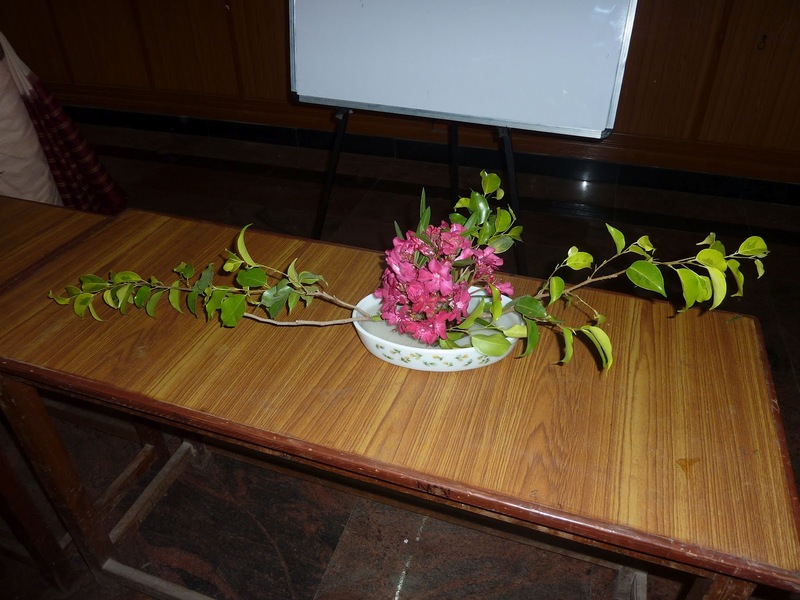 Sensei Meenu spoke about her visit to the Regional II convention, and that will be covered in a separate post. This was followed by a free expression workshop, and here are some of the arrangements. Massed jerberas - artist unknown! 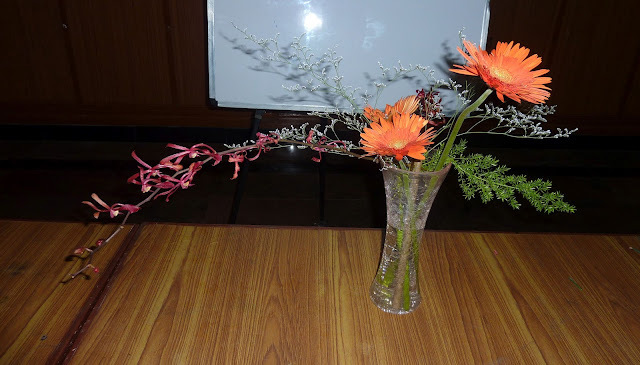 This article by Shoba Narayan who was our guest at the October workshop. 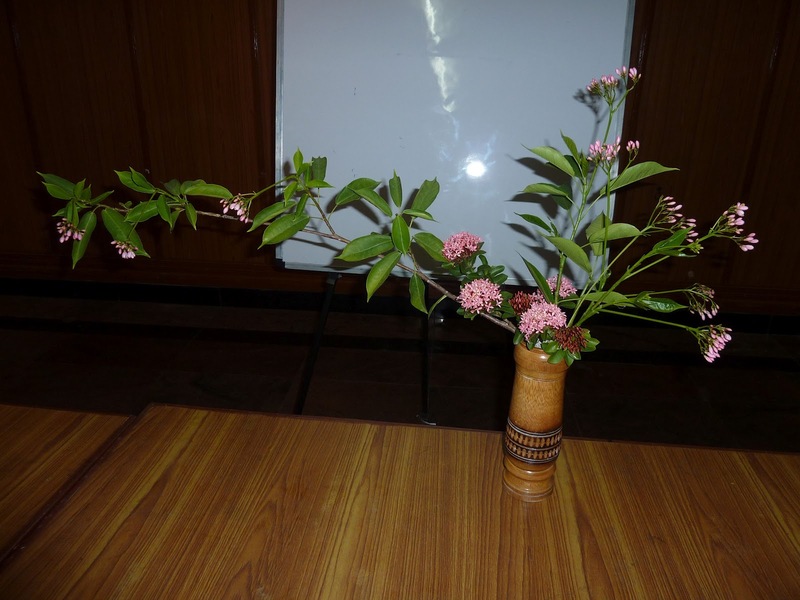 Muhammad said that if you have bread in one hand, you should have a flower in the other because one feeds the body and the other feeds the soul,” says Veena Dass, one of the early Indian exponents of ikebana, the Japanese art of flower arrangement. 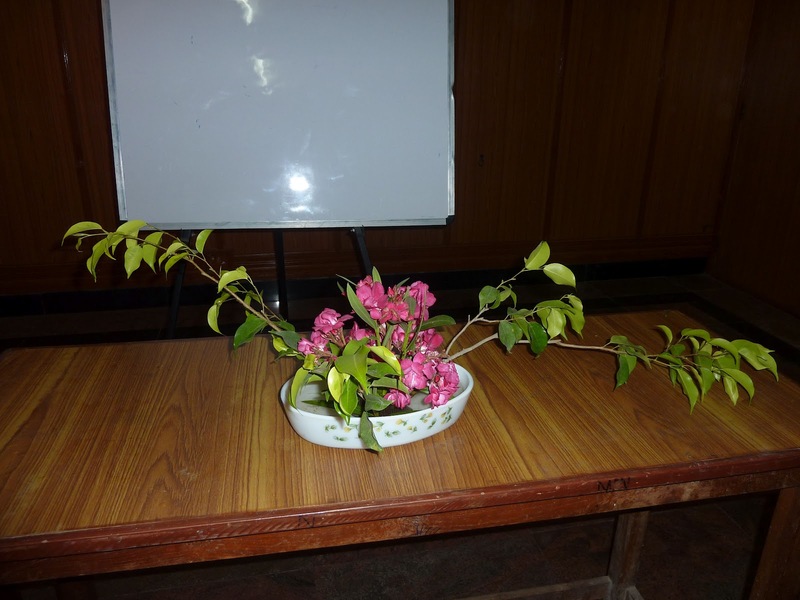 We are discussing the forthcoming ikebana conference in Delhi next week. 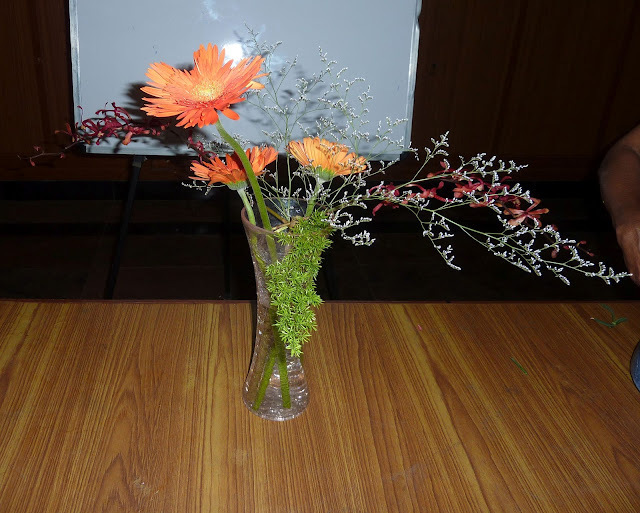 Yes, flowers need conferences too. Delhi is hosting the 12th Asian Regional Conference from 21-25 November at The Lalit. 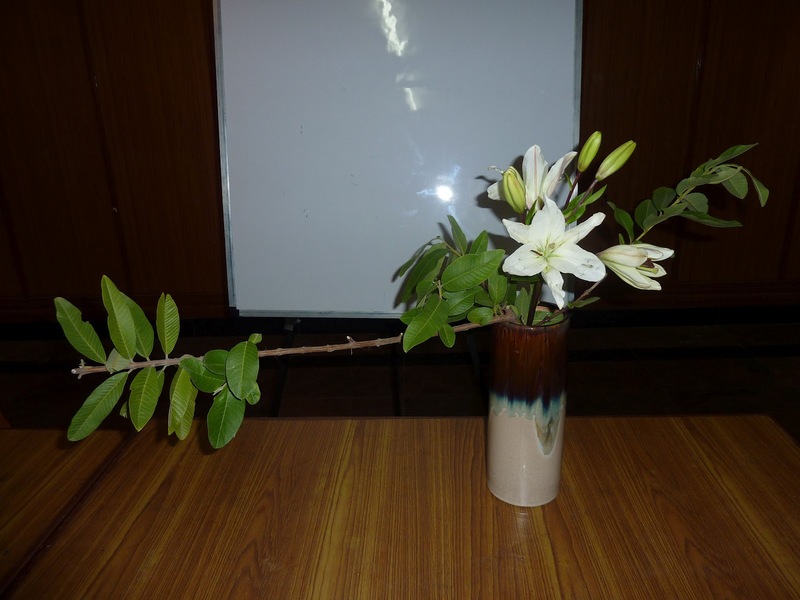 If you love flowers and are in Delhi, you might want to phone Delhi Ikebana International and register to attend. The big names in Indian ikebana, most of them women—the senseis and the rijis, as the various masters are called—will gather to cut and arrange flowers, foliage, branches, rocks and anything else that catches their fancy to create objects of beauty. The two big schools—Sogetsu and Ohara—will have masterclasses for interested participants. 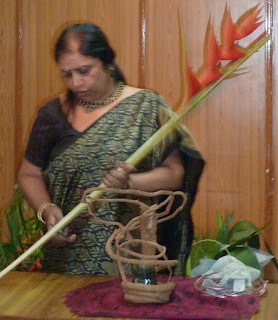 Gursharan Kaur, wife of the Indian Prime Minister, is the chief guest for one masterclass by Rishi Otsuka, a visiting Japanese ikebana artiste. Salma Ansari, wife of our vice-president, will preside over a demonstration by Dass, who was recently conferred the title of Kyoku-jitsu Soko Sho, or the Order of the Rising Sun—Gold and Silver Rays, by the emperor of Japan. Which lends credence to my theory that titles should never be translated because many poetic names and titles sound silly in English. 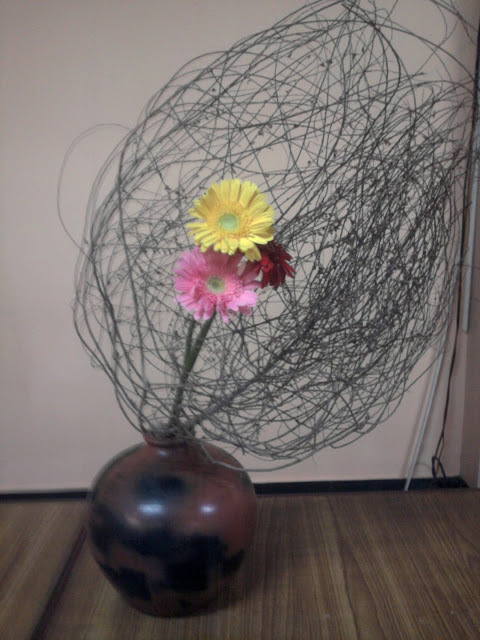 Dass’ presentation will “trace a woman’s emotional journey expressed through the language of ikebana”, she says. 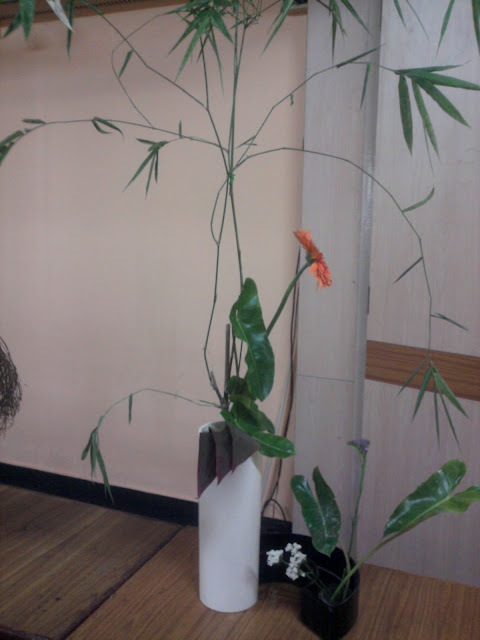 While she does her ikebana demonstration, there will be a live dance performance choreographed by Shovana Narayan. 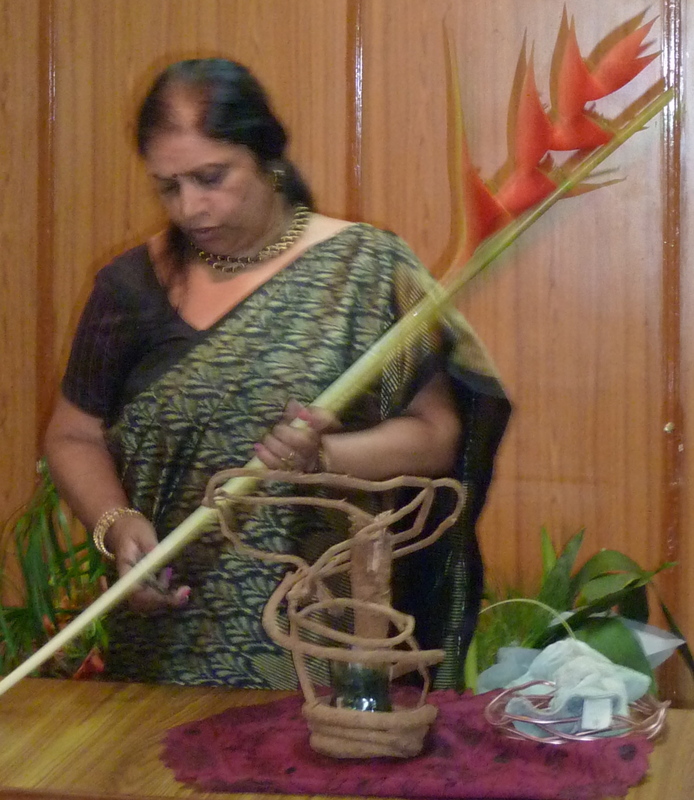 “I am using the concepts of navras, or emotions of the Natya Shastra, and expressing it through ikebana,” says Dass, who was one of the founder-members of the Delhi chapter, established in 1966. They blow me away, these women—these mothers and aunties who belong to a generation before ours. It is not only that they are able to combine ikebana with navras; the global and the local, with feet firmly on the ground while allowing the winds of other lands—or the fragrance of other flowers, in this case—to blow through their homes in a way that would make Gandhiji smile. It isn’t only that they are able to be both modern and Indian—like Chandra Jain, a woman I met recently who combines the spirit of Western volunteerism through her NGO Kadambari with a deep Indian reverence for heritage and craft. What blows me away about these women is how rooted they are in their identity and culture while venturing into the world. Like Sensei Malathi Pandurang, who started the Sogetsu School’s Chennai chapter. 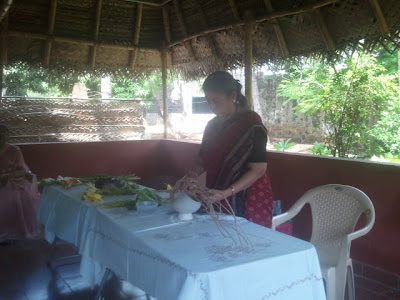 I have known Malathi aunty (she is the mother of my college classmate) for some 20 years. Clad always in simple saris, mostly cotton, she exudes a refinement that comes from years of studying the Japanese aesthetic. Like many of the women who inhabit this space, she is both housewife and artiste. 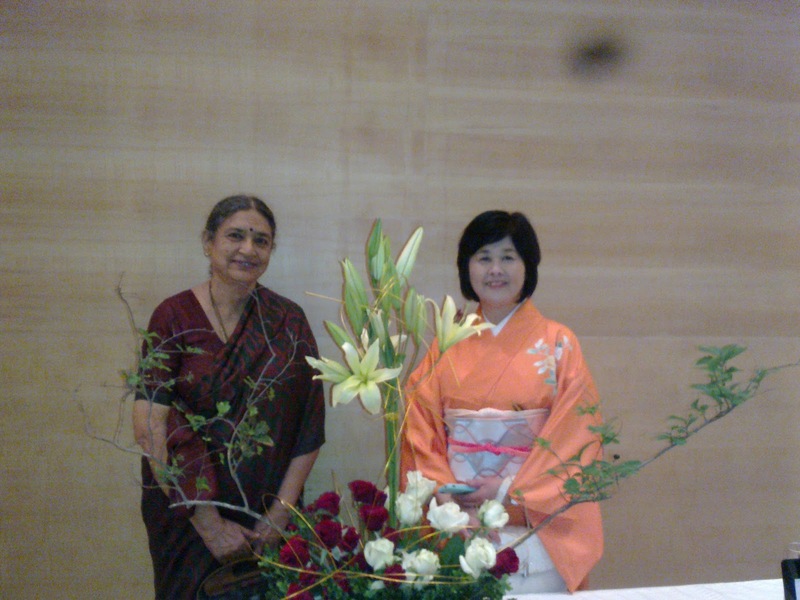 She visits Japan frequently, and speaks Kannada at home. She is among the most senior senseis or teachers in India. Yet she leads a quiet life in Chennai, attending concerts at The Music Academy and family weddings. 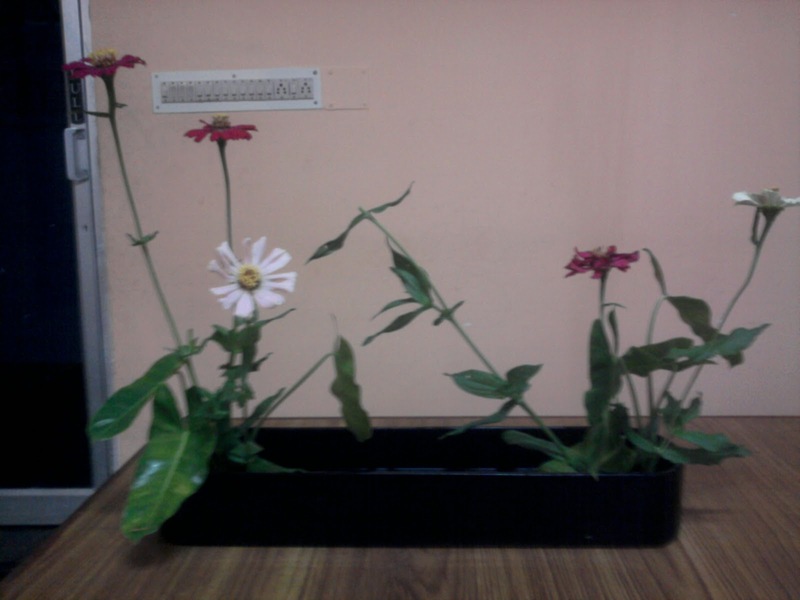 Get her in front of flowers and she changes. At a recent demonstration in Chennai, she offered critiques and provided context. 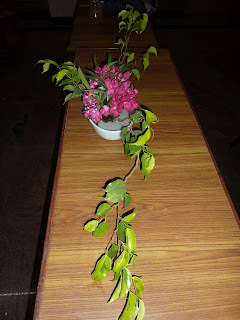 “Delhi and Bangalore are blessed with lots of flowers so the ikebana there is very exuberant and generous. In Chennai, we are forced to be more minimalist.” She doesn’t say this but her tone seems to indicate an approval for Chennai’s minimalism. 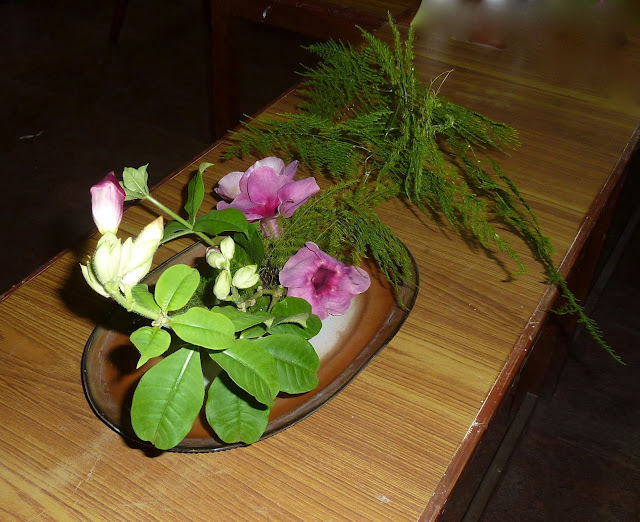 Ikebana and India have a long connection. 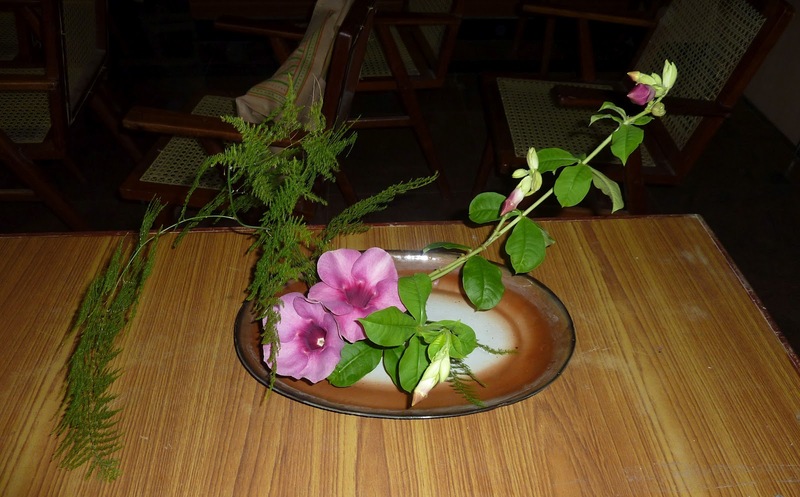 Buddhism went to Japan from India and the temple priests were used to offering flowers to God. “Cut flowers are not part of India’s aesthetic culture,” says Malathi aunty “But once I explain to my students that ikebana originated as a sacred temple art, they infuse it with our concept of bhakti or devotion.” Marrying the local with the global—see what I mean? I don’t know ikebana. My mother learnt it and a couple of years ago, she gave me her vases and bases with spikes—called kenzan. Since then, I have been sticking flowers and stems and converting them into arrangements. 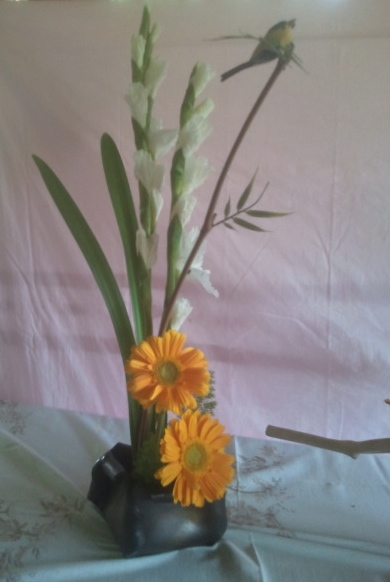 On Facebook, I stalk the Sogetsu Study Group and relax by watching photos of lovely flower arrangements. 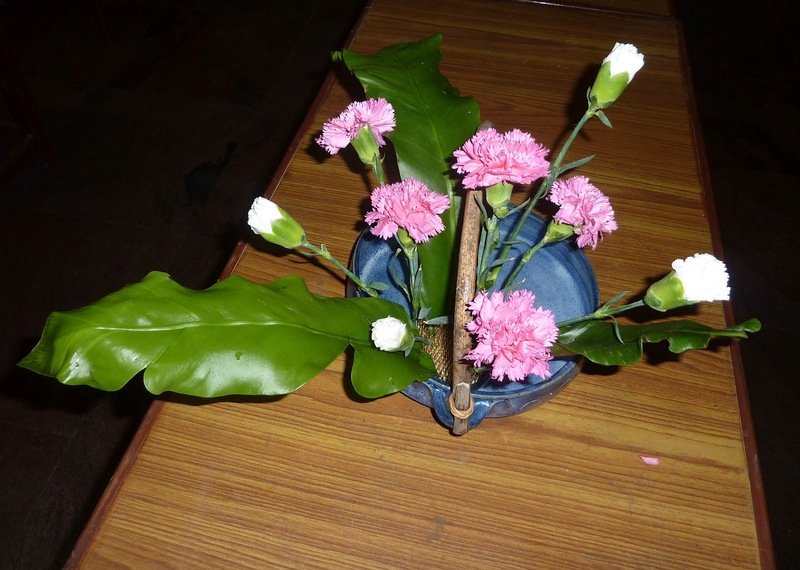 I never considered learning ikebana because I thought it would be complicated, with lots of trips to the florist. That, says Dass, is a fallacy. That’s the other thing I noticed about the ikebana gang. They are foragers. Wherever they go, they pick up objects from nature that have fallen from trees and are discarded: pine cones, flowers, leaves, branches, just about anything. Have you touched a flower today? The umbrella plant - Cyperus alternifolia - was a perfect material for this theme, and sensei demonstrated using it as straight lines and bent into shapes, different ways and different interpretations. 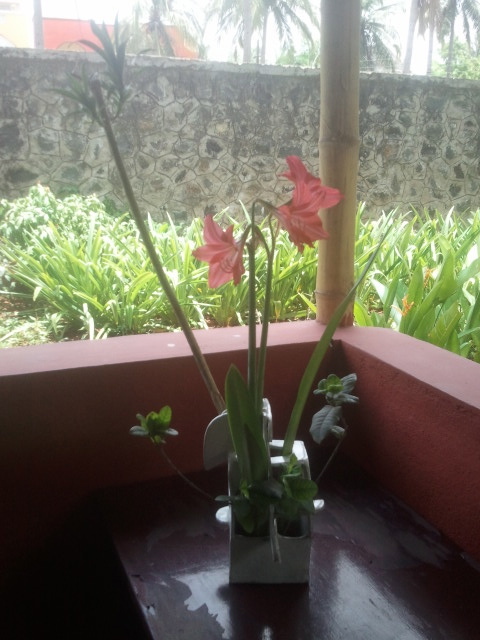 Twin rectangular vases with 4 "windows", was the base for the next set of experimentation. Placed vertically, the same umbrella plant and gerberas was interpreted differently. The ladies had come armed with Deepavali sweets and there was much laughter and eating as well! 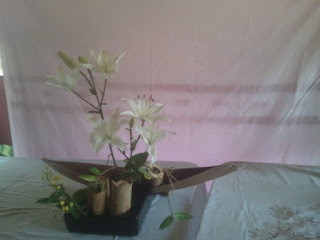 Photos of arragements done by the other participants of the workshop will be put up soon. 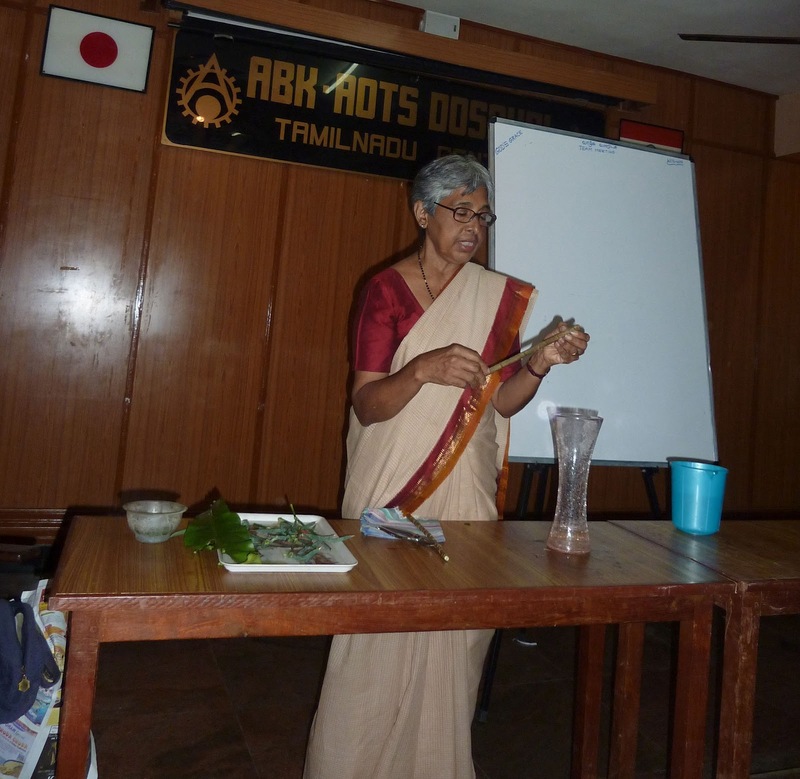 Sensei Remani visited us from Hyderabad, and gave us a lively, colourful and vibrant demonstration of her interpretation and creative expression, using local material mixed with flowers from our local Amethyst store! 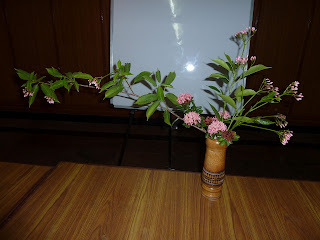 She improvised with vases from Malathi sensei that she came and chose just on the morning of the demonstration, and her flair and confidence were admirable and a lesson for all of us. She started with a dry material with lovely curves, which she used in a round moribana container. See below for the final composition, a low horizontal arrangement emphasizing the curved lines of her material, contrasted with white and green. She then made a bold, dramatic start with these large monstera leaves! The final composition - showing the unusual surface of the Monstera, complimented by lilies. The dry material is the aerial roots of the banyan tree! The display of water gave the feeling of a lakeside scene. 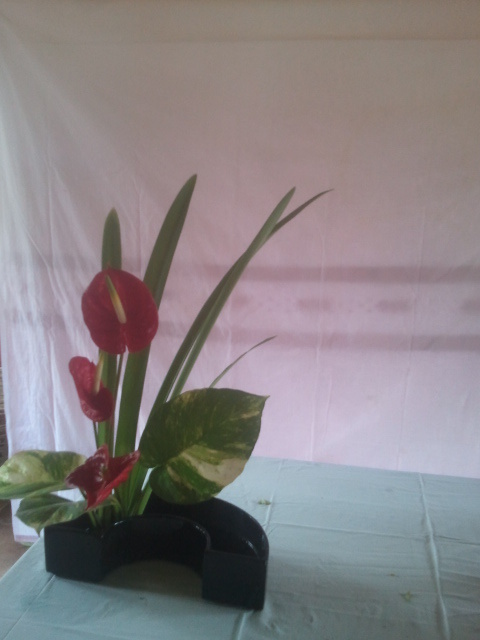 ....to create this composition, taking the colour up and away from the lines below. A bold and stunning statement of colour, using the twin openings of this Sogetsu school ceramic vase, with the small orange flowers harmonising the rectangular composition. daring combination, but it does complete the horizontal effect most aptly! Interpreting the Sogetsu vase which is flexible and can be twisted into any form. 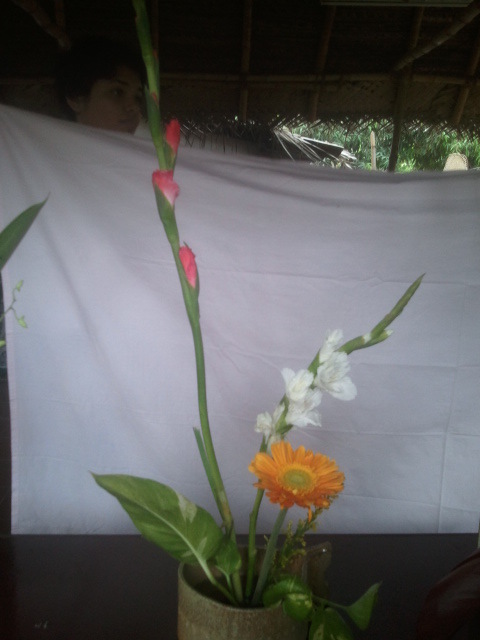 Emphasising Lines in the tall vase and a combination of red anthuriams and the white vase. All in all, a rewarding monring for all of us who watched, including the guests! 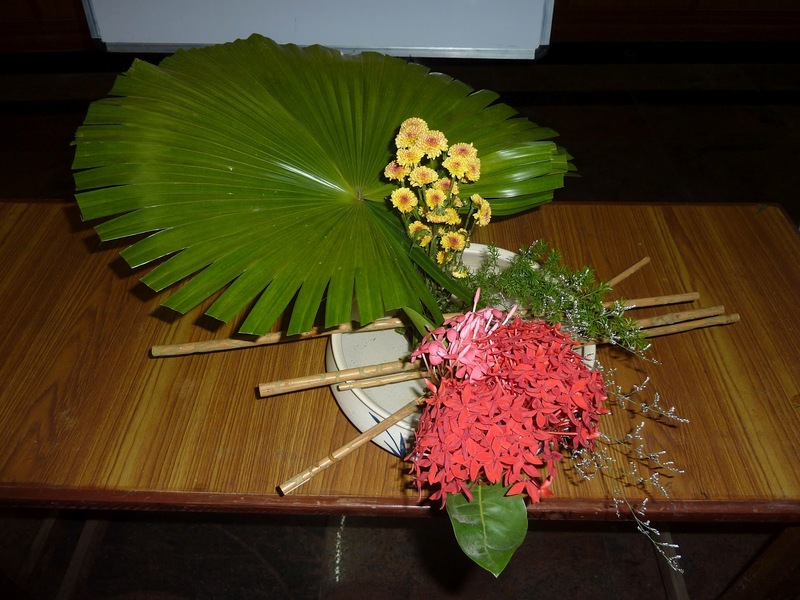 Thank you Remani sensei, and we do hope to see you again in Chennai soon! The Chennai sogetsu Study Group will be meeting on October 5th at ABK-AOTS at their Yamamoto Hall for an Ikebana demonstration by Mrs. Remani Nambiar of Hyderabad at 11.30am. 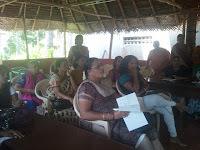 you can give a good cheer to Mrs. Nambiar who has so readily accepted our invitation. 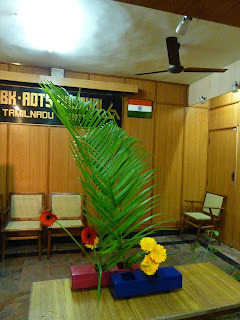 Guests are welcome with the usual guest charges of Rs. 200. 1. Venue:ABK- AOTS- DOSOKAI, 113 Nelson Manickam Road, 3rd floor, Chateau de Ampa, Aminjikarai, Chennai 600 029. 2. Intoduction of Mrs. Remani Nambiar by Malathi. 3. Demonstration by Mrs. Remani Nambiar. 4. 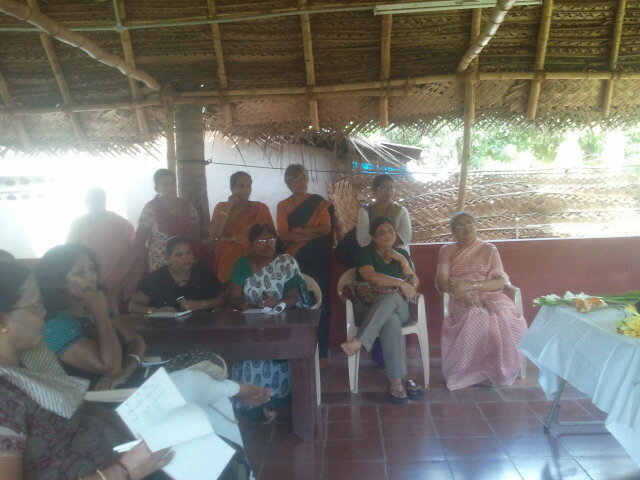 Vote of thanks by Mrs. Meenakshi Sarin. 5. 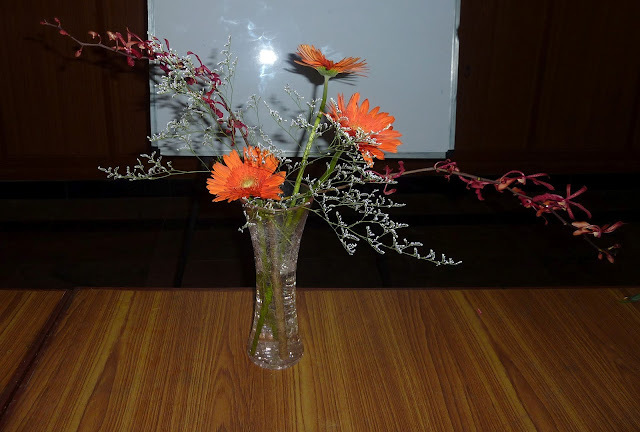 Presenting a memento by Mrs. Ambika Chandrasekar. Please do attend this 'in full attendance' to make it a memorable event of the year. The Chennai Sogetsu Group met for their September workshopon 13th September, at the ABK-AOTS Dosokai hall. Sensei Molly started proceedings with a demonstration on Variation 6, all round style. For the first time, we tried an evening meeting to accomodate the working ladies, but this proved inconvenient for several others! 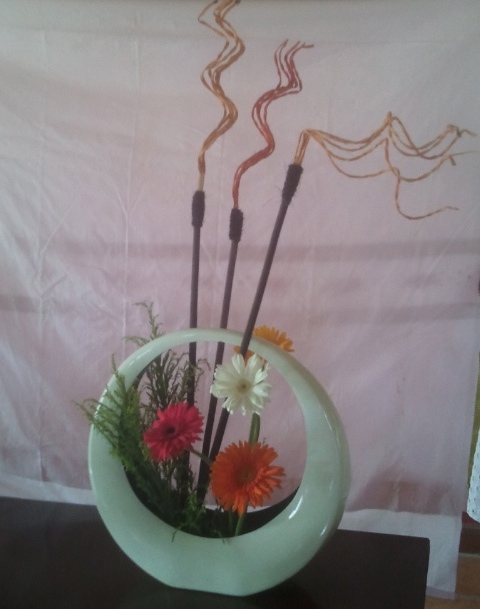 Then she used a nagiere glass vase, with a vertical cross bar. Beautiful, all round views. 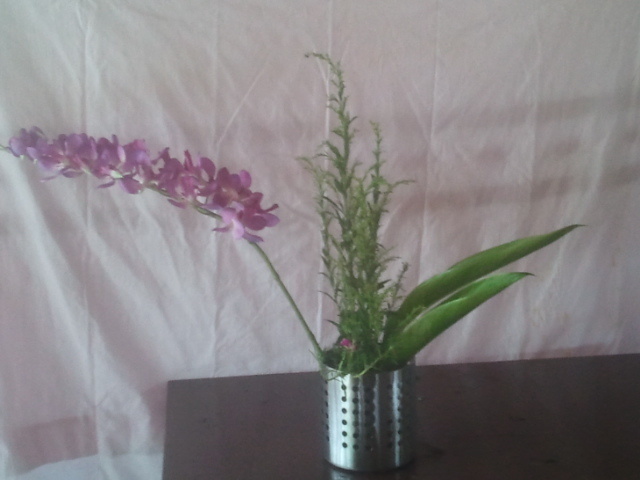 Jerberas, orchid, everlasting flower, and fern. There were ten members at the workshop, and some tried their hand at Variation 6, while others looked at working with interesting vases. In October, we hope to have Sensei Ramani visiting from Hyderabad. Details will be announced soon! 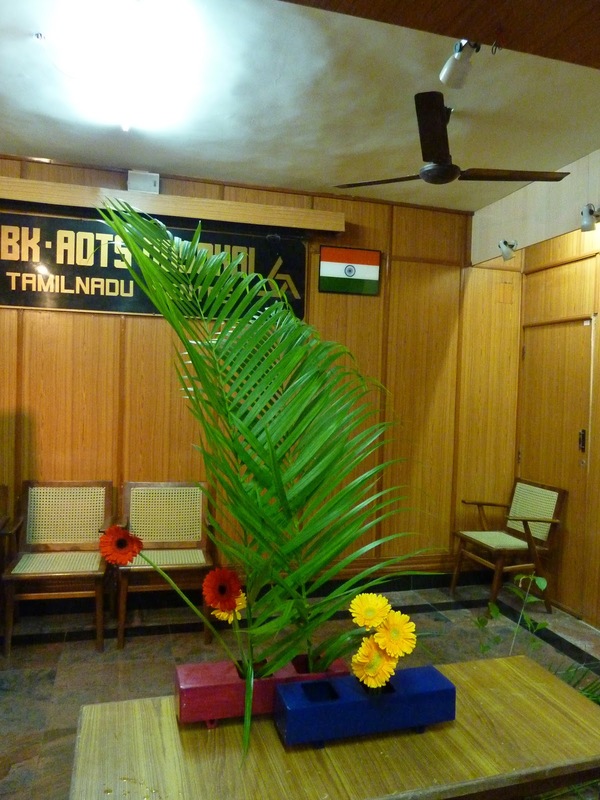 Our first meeting after the summer break was held on 8th August at Kalpataru, a hobby centre on ECR road, Chennai. There was a good attendance by the members with 4 absentees. As the programme was announced in many newspapers, there were some 8 to 10 interested visitors who enjoyed the demonstration by Sensei Padma, the theme being " using more than 2 kinds of materials in a Free Style composition"
Mrs. Meenakshi Sarin hosted the event. I must say the ambience of Kalpataru really complemented the event. 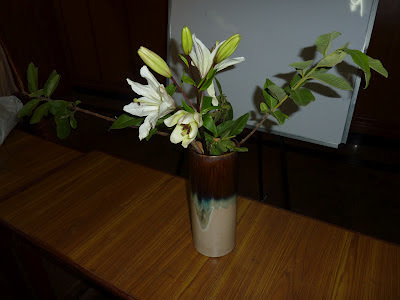 Padma showed how to take advantage of the shape of the vase to begin the floral composition, using bleached mitsumata, asia lilies,hosta leaves and completed with golden rod flowers. 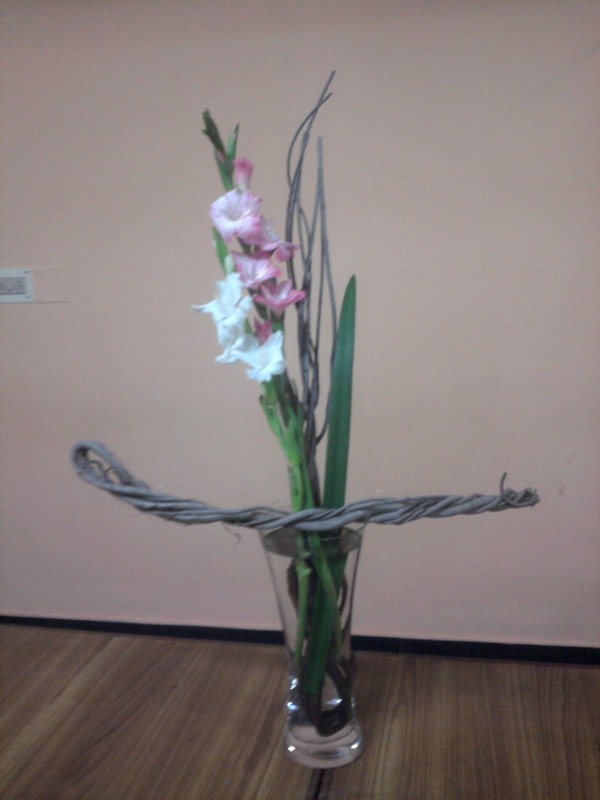 For this arrangement she chose the flat or horizontal style. There were few questions after the demonstration, which Padma clarified. Padma received warm and hearty applause from the audience. 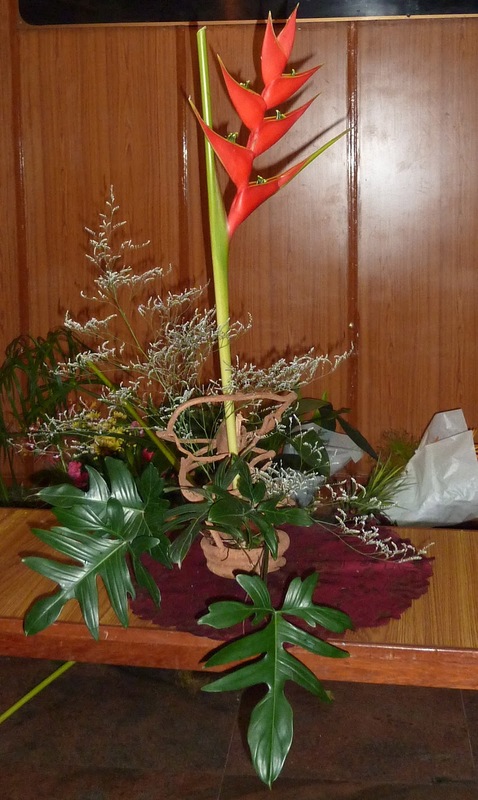 The workshop then continued with the same theme, and members all worked to produce beautiful arrangements with the same theme. All the photos are not here, and also if there are errors in naming the artist, please mention in the comments! There was good fellowship with snacks and tea. 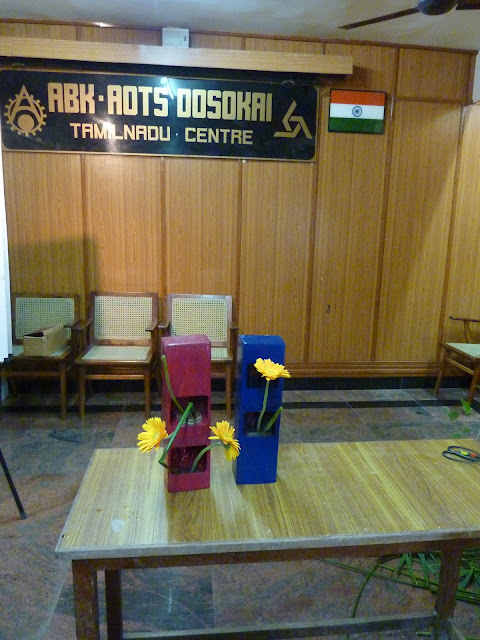 The next workshop will be at ABK-AOTS on 13th September in the evening from 4.30pm to 5.30 pm. Hope the working members will make it for this workshop. 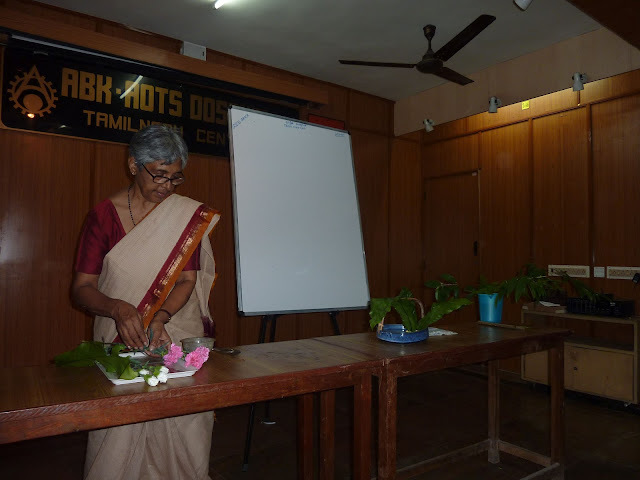 Mrs. Molly Cherian will demonstrate a textbook lesson, again using more than 2 kinds of materials.